Karma: the force created by a person’s actions that some people believe causes good or bad things to happen to that person. It is also said that what goes around comes around, so with that being said you should do as your mother has ALWAYS told you when you were a small child and treat people the way that you want to be treated. Tierany is a good girl. She is 15 getting ready for her sweet 16 birthday and causes her mother no problem which is unusual for a teenager but she also know that her mother has enough issues so she doesn’t want to add to them. All Tierany wants for her birthday is a good time with her friends and the love of her parents, that shouldn’t be too much for a girl to ask ~ or is it? Shauni is Tierany’s mother and wants nothing more than to see that her daughter has the best sweet 16th birthday possible but her boyfriend Rob is running interference. Shauni is the type of mother who will do whatever it takes to make it happen for her children by ANY MEANS NECESSARY and that means with or with Robs’ help. Tre’ is Tierany’s father and Shauni’s high school sweetheart. They have parted way many years ago but there is nothing that Tre’ won’t do to make his daughter’s dreams come true and if that includes making Shauni’s dreams come true then so be it. No one will ever stand in his way of making his two favorite girls happy. When life-altering events happen on Tierany’s sweet 16, Tre’ steps up and everyone has to change their way of living, for better or worse. But one thing is for sure ~ karma is swift and it is definitely sweet. In The Blink Of A Bullet is the freshman novel for author Akilam and it is a very well written novel. There are some minor editing errors but nothing that takes away from the story. It is a very intense storyline that keeps you engrossed in the story until the end. I look forward to reading more about this story and more from this author in the future. Great start to your writing career, keep up the great work! 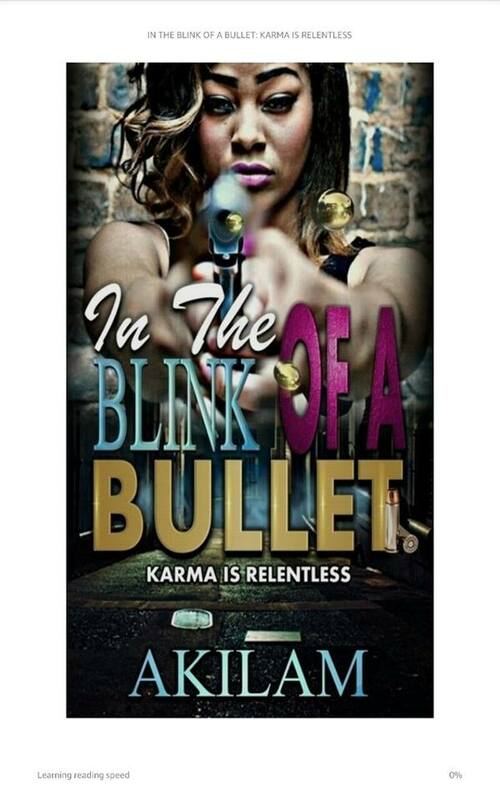 In The Blink Of A Bullet: Karma Is Relentless is available through Amazon.com in Kindle edition.